These four buildings have an outstanding 100% occupancy rate. 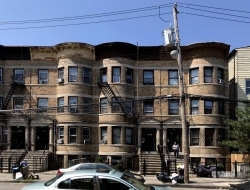 Bronx, NY, March 08, 2019 --(PR.com)-- Andrew Lichtenstein, President of LichtensteinRE.com, negotiated the sales contract of four contiguous properties for the asking price of $3,650,000 all cash. The properties are located at 238, 242, 242 1/2 and 244 South 3rd Avenue in Mount Vernon, Westchester County, New York. Three of the properties are Brick, walk-up, Pre-War, Victorian Queen Anne Architectural Contiguous Brownstones and the last one next door is a frame Apartment Building. These three story properties contain 22 legal residential units plus a basement apartment for a total of twenty three residential units. Two of these buildings contain four residential units each, one contains six residential units and the last one contains eight residential units. The 4 contiguous properties sit on 12,632 total square feet of land lots. The buildings contain a total of four (1) bedroom, three (2) bedroom, five (3) bedroom and ten (4) bedrooms residential apartments. All twenty two apartments are rented for an actual low average of $1,747 a month. The Total Gross Annual Rental Income Actual & Projected all Sources is $461,305. The buildings have an outstanding 100% occupancy rate. The contract price of $3,650,000 represents an excellent capitalized return on investment for the lucky buyer presenting big upside long term future potential income. “The buyer is an experienced landlord in the neighborhood. His expertise will help him increase the rents in the buildings,” Andrew Lichtenstein explains. The property is located on the South Side section of Mount Vernon, Westchester County, near the downtown business district and municipal establishments. The property is close to public transportation like the Metro North, the Westchester Bee Line and the NYC MTA # 5 and # 2 trains. The property is being marketed exclusively by Andrew Lichtenstein, Inc. LichtensteinRE.com has been actively selling multifamily and commercial real estate for its clients in and around New York City. LichtensteinRE’s greatest ability is creativity and problem solving. After selling the owner’s property, LichtensteinRE has assisted successful sellers in locating replacement 1031 tax deferred exchanges and in some cases has more than doubled the seller’s net income post-closing. To learn more contact Andrew Lichtenstein at (800) 242-9888 or AL@LichtensteinRE.com.